Do you ever wonder what it is in hairspray that keeps your hair perfectly in place? Or what the secret ingredients are in lipstick that allow you to wear it for hours on end? Well, it is all due to one big beauty secret: science! Cosmetic chemists, researchers, and product developers make their living making you look good. Their hard work and study behind the scenes turn into your favourite products on the counters. Although a science degree is usually seen as a little less than glamorous, it can lead to an exciting job in the beauty industry. Charles Galaise, Manager of Product Development for Lek Incorporated, assures us that his job is just that. “It’s never boring because there is not a set routine,” he says, “and every day there are new challenges to look forward to.” When Galaise graduated from Sherbrooke University with a chemistry degree, he was unsure of what to do with it. He was pleasantly surprised to find a huge range of opportunities in the cosmetics industry. Katy Klosowski, Regulatory Affairs Manager for P & G Beauty, says although her degree is in biochemistry, she uses many other skills in her job for the business and marketing aspect of each of the products. Klosowski is from Arnprior, a small town just west of Ottawa, and she graduated from the University of Guelph with an honours degree in Biochemistry. On a daily basis, Klosowski ensures that products follow all Canadian regulations and are safe for consumers to use. Her most recent work started in November 2006 when a new law was enforced that all ingredients must be labeled on products. In order to pursue a technical career in the cosmetics industry you should have a science degree, an eye for detail, and good organizational, creative, and communication skills. Professionals in this industry start with salaries around $30,000 and $35,000 and can later make up to $75,000. Although the science world is typically dominated by men, cosmetic science currently has a ratio of approximately 50/50. More great jobs: Cosmetics not for you? Check out these other cool jobs that come from science backgrounds. Marine Biologist Biology You explore the ocean and spend time with exotic creatures. Engineering You travel the world looking for ways to save it. Athletic Therapist Kinesiology/Biology You help athletes and other sports enthusiasts continue doing what they love. Forensic Scientist Biology/Chemistry You solve mysteries and bring criminals to justice. Veterinarian Biology You tend to animals in need and spend time with animal lovers. 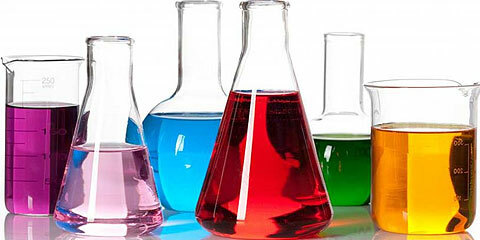 Nutritionist Chemistry You help people live a healthier lifestyle.